TODAY’S MARKETPLACE OF competing products can make crop protection purchase decisions a significant planning task. This planning can also include a strategy to qualify for various grower pricing programs to maximize the discounts and rewards available. Here is an overview of six of the main grower programs currently available from product manufacturers. BASF’s core portfolio grower program is called AgSolutions Rewards. “Our goal is to reward loyal growers who make multiple purchases of BASF herbicides and fungicides,” says Andrew Elgersma, Grower Services Manager. The rewards program, recently revamped to a more simple structure, encompasses all of the main BASF products sold to corn, soybean and wheat growers. To qualify for the program in 2014, growers must purchase a minimum combined total of 240 acres of any two participating crop protection products. Participating corn products include Integrity®, Priaxor®, Armezon®, Marksman®, Prowl® H20, Headline®, Frontier® Max and Distinct®. Soybean growers can receive rebates on Optill®, Assignment, Priaxor®, Conquest® LQ, Clean Sweep®, Basagran® Forté, Pursuit®, Prowl® H20, Headline® and Frontier® Max. The three wheat products included in the program are Eragon®, Twinline® and Caramba®. Growers with 240 to 999 qualifying acres are eligible for a three percent rebate on the above herbicides. The next level is a five percent rebate when 1,000 to 2,499 acres are qualified and an eight percent rebate is offered on over 2,500 acres. All eligible participants will also receive an eight percent rebate on Twinline®, Headline® and Caramba® fungicide purchases as well as a 20 percent rebate on Lance® fungicide. BASF is also offering an Action Packed Offer in 2014 where growers can save $2.22 per acre on matching acres of Integrity® and Marksman® and/or Armezon® and $3.33 per acre on matching acres of Frontier® Max and Conquest® LQ and/or Clean Sweep®. These savings are in addition to the AgSolutions Rewards program. An online calculator tool is available at www.agsolutions.ca and is a helpful way to determine your projected 2014 rewards. With the goal of being simple to understand, Bayer CropScience’s BayerValue Program was unveiled under a new structure in 2013 and will be continuing next year. “We want to be the easiest program for growers to use so the basis of BayerValue is simply that if you spend $1,000 or more, you’re eligible for a rebate,” says Chris Turcot, Portfolio Manager. The program is based on four purchase levels and related rebates. Growers who purchase over $1,000 worth of Bayer CropScience products are eligible for a three percent rebate on all crop protection products. The silver and gold program tiers are available to growers at the $7,500 and $15,000 levels and offer five and eight percent product rebates respectively. The maximum savings available – a nine per cent overall rebate – is available to platinum level growers who purchase products over $50,000. Growers at all levels are eligible for a special rebate on Proline® fungicide. This rebate can be calculated by doubling the overall product rebate at each level, meaning a savings of six to 18 percent on this product. “We understand that money is important to our customers and to reward loyalty, we offer the program to support their businesses,” says Turcot. While 2014 details were not confirmed at time of press, he says that growers can expect a similar program to what was released in 2013. Past program participants are automatically re-enrolled for the upcoming year but growers who are new to BayerValue must sign up through a retailer or by calling the Bayer CropScience Rebate Fulfillment Interaction Centre. Updated information can be found at www.bayercropscience.ca/bayervalue. DuPont’s main rewards platform for Ontario growers is titled the FarmCare® Row Crop Rebate Program. In 2013, this program offered two levels of rebates per acre on eligible corn, soybean and cereal products including Accent®, Assure® II, Battalion®, Guardian®, Refine®, Ultim® and more. Growers who made combined purchases of 50 to 399 acres were eligible for club rebates and purchases over 400 acres qualified for platinum rebates. Participants also had the opportunity to meet the requirements for the Guardian® Early Purchase Program – a discount available at point of sale before February 15, 2013. While the 2014 layout was not released at time of press, DuPont Canada Crop Protection Launch Manager Dave Kloppenburg says growers can expect some changes going forward. “The emphasis of the Row Crop Rebate Program is on our total portfolio of products. We are looking to simplify the program terms in 2014 and we will be adding a reward element to encourage the use of Acapela™ fungicide in conjunction with corn, soy and cereal herbicides,” he explains. He notes that this change is beneficial for all parties involved as early purchase rewards are a way to recognize growers who understand the importance of early weed control planning in addition to assisting retailers to ensure product quantities are available. DuPont programs typically do not require a specific sign up and are administered directly through local retailers. 2014 program details and a calculator tool will be available online at www.dupont.ca by January. Monsanto and BASF will continue their partnership in 2014 and offer a rebate on matching weed control product purchases. Growers will receive a $1.00 per acre rebate when Roundup WeatherMAX® is purchased with matching acres of Integrity®, Eragon®, Marksman® and/or Amezon® herbicides. This program is applicable to the sales period of October 1, 2013 to July 31, 2014. “These products are a great fit for controlling a variety of weeds and we offer this rebate incentive to encourage best practices for multiple modes of action for weed control,” says Elgersma. Nufarm has traditionally marketed itself as the crop protection company without a grower program. They explain that they have instead focused on upfront product pricing to provide growers the benefit of instant savings. 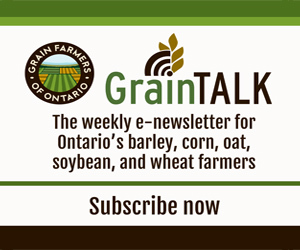 But according to Central-Eastern Ontario Territory Manager James Ferrier, Nufarm knows that to grow and be competitive in the soybean marketplace, they need a rewards program. That said, 2014 will mark the launch of Nufarm’s new Resistance Management Program. The focus of the program will be BlackHawk™ herbicide. BlackHawk™, coined as the first and only burn down solution with two active ingredients and two modes of action, will be provided free to growers who purchase other soybean products, namely Step-Up™ and Chaperone™. “We want to show our concern and support to growers who are struggling with resistance issues. We stand behind the product and want to help growers find the right solution at the right price,” says Ferrier. Qualifying information and other details will be announced at www.nufarm.ca and through territory managers this month. Syngenta’s key grower reward system is the Syngenta Partner Program™. Syngenta assigns a point value per unit to eligible herbicide, fungicide and insecticide products and growers collect points through the purchase of these products. For example, Boundary® herbicide is worth 300 points per unit purchased, Bravo® fungicide offers 2 points per litre and 80 points per bag is earned through the purchase of Force® insecticide. In 2013, Partner Program™ points were to be accumulated from purchases at any retailer from November 1 to October 31. Growers with 2,500 points received a cash reward of $200; 5,000 points earned buyers $500; 7,500 points equated to $800; and those with 10,000 points received a reward of $1,200. Once growers reached the 10,000 level, point accumulation began again. “Syngenta offers a broad portfolio of products to help farmers grow the best crops and this national program is our way of saying thank you and recognizing growers for doing business with us,” says Claire Cowan, Campaign Lead, Corn & Bean. Past participants are automatically registered for the coming year and new growers can sign up by calling Syngenta’s Customer Resource Centre. 2014 program details will be posted to www.syngentafarm.ca/partnerprogram as they become available. Syngenta’s online calculator tool will also be updated to enable growers to estimate points. While researching the terms and conditions of each program and comparing rewards requires an investment of time, an annual review of what is available from each manufacturer arms you with the knowledge that could lead to increased savings for your operation. Geographic program differences, registration qualifications and purchase dates are aspects to specifically note during your research to ensure you are projecting your eligibility properly. Many retailers also provide rebate programs on a regional level and growers are encouraged to speak with their local representatives to learn more. While cash rebate opportunities await growers at the retail counter, Ontario farmers also have the opportunity to earn rewards in the field by participating in yield challenge programs. The following challenges were open for entries in 2013 and offered significant prize incentives. Presented by Country Farm Seeds Ltd., this challenge awards growers who attain a soybean yield of 100 bushels per acre or a corn yield of 300 bushels per acre. The cash prize for both winners is $25,000. This competition is presented by Dekalb and is open to growers within Dekalb’s 10 Eastern Canada territories. Territory yield winners have the chance to win a $3,000 credit towards next year’s seed purchase or an all-inclusive trip for two to Costa Rica. Maizex divides Ontario into three zones (2700 CHU and under, 2750 to 3000 CHU and 3025 CHU and above) and awards zone winners with an expense paid two-night stay in London, Ontario and registration to Grain Farmers of Ontario’s March Classic. The grand champions of this challenge also receive an Apple iPad. This province-wide corn challenge hosted by DuPont Pioneer attracted 453 participants this year. One winner in each of the 10 account manager territories is awarded a trip for two to the Commodity Classic.